Florence is a city rich not only in art and history, but also in curiousities and intriguing secrets. Today we will speak about the mystery related to those ancient shrines dedicated to a very important product of the city’s both culture and economy. 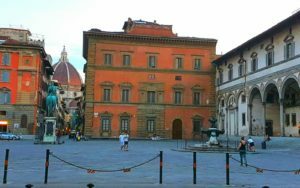 If you have been to Florence, probably wandering in the streets of the center you could have seen some “buchette” (small openings) on the ground floor of the facades of palaces. These small holes are all very similar: they have the shape of a small door with a higher arch, decorated by a dropped frame, and closed by a wooden door. What were those little holes for? Well these are “wine tabernacles”. Their origin dates back to many centuries ago: at the end of XVth century the trade in textiles and linen, a driving engine of the Florentine medieval and Renaissance economy, began to encounter the fierce competition of the northern countries, especially England. The nobles, the bankers and the Florentine merchants sought new markets and decided to invest their capitals in land and possessions. The new landowners invested on the typical products of the area and particularly on wine. Those little holes are the result of strong investment in wine production. 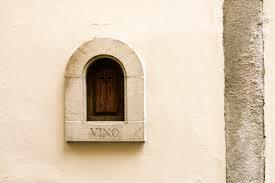 Through these openings the producers directly sold their wine on the street, without other intermediaries, such as taverns. The little holes were placed on the ground floor at the same level as the palaces’ inner cellars to allow a quick and easy sale. Did you like this story? Then they will like also our guided tour of History of Florence! One of the best things about Florence is that at every corner, if you raise your head and look around, you always have the opportunity to discover something new. Near the Cathedral of Santa Maria del Fiore you can find the Church of Santa Maria Maggiore. 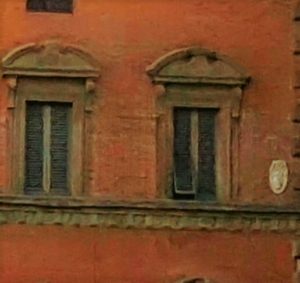 In the side of the tower overlooking Via dei Cerretani you will notice that there is a “petrified head” embedded in the bricks: This is the “Berta”. According to one school of thought, it seems that this head is there from 1326 because of Cecco d’Ascoli (an astrologer condemned to the stake). The man was led to death and casted a curse to a woman who, denying him water, had prevented him to save himself from the flames (he had made a pact with the devil). According to others, Berta would have been a greengrocer who gave the church a bell, so that it could be used to alert citizens with its chimes about the opening and closing of the city gates. 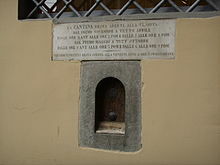 This small bust is therefore a sign of recognition of the Florentines to Berta.